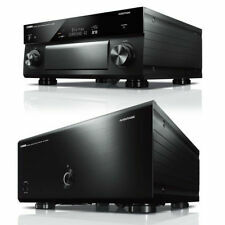 YAMAHA AVENTAGE CX-A5100 11.2-ch balanced Pre/pro and rca. Condition is Used. Shipped with UPS Ground. this unit is a one owner purchased from Yamaha new. this unit has been well kept in a non smoking cool environment with a temperature controlled rack. it has served me well through out the time of use. I decided to downsize from separates to a receiver. thanks for looking. The AV7702MKII works great! The AV7702MKII has updated to the latest firmware and factory reset. 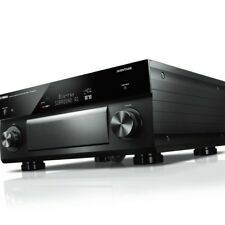 Full details and specifications of the Marantz AV7702MKII can be found here. Anthem AVM60: 11.2 Pre-Amp Surround Sound Processor / Preamp with Dolby Atmos & DTS:X, both RCA and XLR inputs and all Channels RCA & XLR outputs. This is the absolute best quality built, sounding, and equipped surround sound processor/premap on the market. Its in new condition . Couldnt afford to buy speakers that's decided to sell.. Condition is Used. Has Auro 3D, Auro 3D blue ray Demo disc, and remote. Yamaha CX-A5000 11.2 Channel AV Preamplifier. Harness the latest technologies in audio and video in your theater and pair it with the MX-A5200 Amplifier for the ultimate experience. Dual ESS SABRE PRO ES9026PRO Ultra DAC. Further, the DACs also minimize noise levels and achieve an exceptional signal-to-noise ratio. Yamaha CX-A5200BL Specs. D/A Converter 2 x ESS 384 kHz / 32-bit SABRE PRO Premier DAC ES9026PRO for all channels. Range: 33' / 10 m. Other Ports 1 x RJ45 Ethernet LAN. Standby Power Consumption ≤0.1 W.
Sony TAZH1ES Headphone Amplifier. Condition is Used. Shipped with UPS Ground. 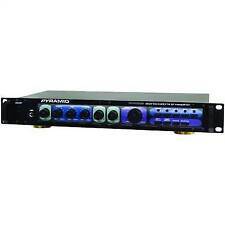 Yamaha CX-A5000 11.2 A/V Preamp - Audiophile Quality This item is functioning properly in every respect. It looks great and performs to perfection. This is Yamaha’s former flagship preamp before they released the CX-A5100 ($1995 on Amazon now) The following is an overview of the features… Absolute Quality, Absolute Realism.11.2-channel AV Pre-Amplifier at the pinnacle of the AVENTAGE Series. Superb sound quality combined with fine craftsmanship ensures an unequalled listening experience. Latest technologies include high rigidity chassis, ESS DACs and reliable balanced connection. AVENTAGE Concept 11. PER ONKYO Website We are not perfect. We are not experts in any collecting field. I am the original owner. In excellent condition. Everything works. Never had a problem. This was my second Integra preamp processor. Rock solid. The pre-amplifier was manufactured with strict standards to bring them the best quality. Small Parts Warning not applicable. Manufacturer SKU PYRPR2500. Stereo/mono switch. Used with the MX-A5000 11.2 channel power amplifier, it achieves overwhelming silence and sound filled with dynamic feeling. MCACC Pro corrects phase differences in all ranges and all channels, from phase difference in the original audio material to the sound emitted from the speakers. Required microphone included. Using the Pioneer Elite Dolby Atmos Enabled Speakers you will need the following in order to use the Dolby Atmos-enabled capability of these speakers, the listening room ceiling should have horizontal flat hard surface (for audio reflection) and a height of 8’ to 14’. By expertly harmonizing traditional and advanced technologies, every factor that affects sound quality, from materials and parts to construction, layout, vibration damping (unique foot) and “fine-tuning” the sound, is handled with no other thought than to achieve the best possible audio quality. Dolby Atmos. Featuring support for both HDCP 2.2 DRM copy protection-necessary for Ultra HD content- and HDMI 2.0 for 4K 60 Hz and theatrical 21:9 video aspect ratio. The DHC-80.6 also effortlessly converts standard definition video signals from legacy devices to 1080p Full HD or stunning 4K Ultra HD. Not included in this sale. Ruler, holder or any other object not described. We have this preowned Yamaha CX-A5100 AV Pre-Amplifier in Black. It is in excellent condition which can be seen in the pictures attached. 11 channels give you the flexibility for a centre, six surrounds and four overhead speakers – plus two subwoofers – for 7.4.2 surround sound. In addition to supporting high-definition music distribution service "Deezer HiFi ¹" which can listen to streaming with high sound quality of CD equivalent (FLAC 44.1 kHz / 16 bit), IP simuladio distribution service "radiko.jp ²", music distribution service "Spotify Spotify Connect ³ (Spotify Connect) function to enjoy streaming listening conveniently. ■ It is beautiful overall. And even newer turntables that may feature a built-in preamp probably aren't going to give you the highest quality sound that could be achieved from an external preamp. The new pro preamp is equipped with both RCA and DIN outputs that you can connect to amplifiers, mixing units, and recording units. CONVERTS PHONO SIGNALS: A turntable preamp that converts phono signals to Line Level Signals. Phono Turntable Pre-Amplifier. Connects to turntable output bringing phono level up to line level. This electronic preamplifier stands up to the test and will provide you with serious sound performance. Output Power: 100W 100W R.M.S Power: 2x4W R.M.S Power: <0.1% at KHz Input Sensitivity: 200mv Input Impedance: 47K Speaker Impedance: 4ohm to 16ohm Frequency Response: 20Hz to 20KHz Min. DC input power: 12V (2-4)A Max. Crunch PX 1000.2 Power Amplifier (Class Ab, 2 Channels, 1,000 Watts Max). Power Amplifier (class Ab, 2 Channels, 1,000 Watts Max). We're happy to help. We do not accept P.O. Boxes. We feel we've created a product with the sound, looks, and overall quality of computer interfaces priced much higher. Audioengine D1 Premium 24-bit DAC (digital-to-analog converter) allows you to bypass your computer's soundcard or headphone output and send audio through USB or optical. Model Number: AD18. Up to 10m. Independent Headphone Amplifier Design, you could choice the speakers and headphones you like. Power amplifier output power (4ohm): 80W 2. Output interface: amplifier output port, headphone port. This is a HiFi phono preamp. you can use it for all turntable player. it's very helpful, and i use many HiFi Electronic component on this product. sound is very good. very low back noise. and sound is very clear.